Ear infection happens when a child has a cold and fluids that was not drained built up in the middle ear, behind the ear drums. When bacteria infects these fluids, it will cause pain and discomfort. Antibiotics is needed to clear up the infection. 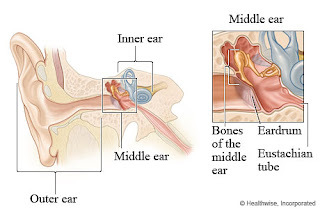 Ear infection is a common childhood illness among babies and children in the US. Some babies have 6-7 ear infections in their first year. To be honest, I have never heard of ear infection until I came here. I don't think children in Malaysia has ear infection but I could be wrong. I believe one of the reason could be that when we have a cold in Malaysia, we would run to the doctor to get medicine and if our mucus is green, the doctor would prescribed antibiotics, therefore eliminating any ear infection that might occur. Olivia was fussy and having trouble sleeping the past few days and it turned out she has a right ear infection. This is her first ear infection. So, now she is on antibiotics for 10 days. Already, she is sleeping much better and I am glad she is no longer in pain. We have found some other ways of alleviating ear infections instead of medicine, too. Garlic oil put in the ears is great, just not when the ear drum bursts. Peroxide works, but it gets really warm, so not good on a young child. And warm lemon juice and water in the ear. Any of those work. But one of my favorite remedies is breast milk in the ear. Works like a charm on ear infections and pink eye! poor Olivia! !.Usually when baby sick,doctor will suspect ear infection the first thing but so far my Mishu never get one!! touch wood! !.She always get throth infection .Every throth culture came back positive...Yes,have to be very careful wt ear infection,I hear.I also dunno why it happened. I had ear infection when I was about 7 years old and it was excruciating! I cried all the time and I couldn't eat anything. I think that children do get ear infection everywhere. I was told that it is because they don't know how to blow their nose yet. Ian gets it quite often..so it is common here...hehe..don't worry, she will be fine. qtpies1- thanks for dropping by and all the tips. sayangmommy - thank you. She is feeling better.